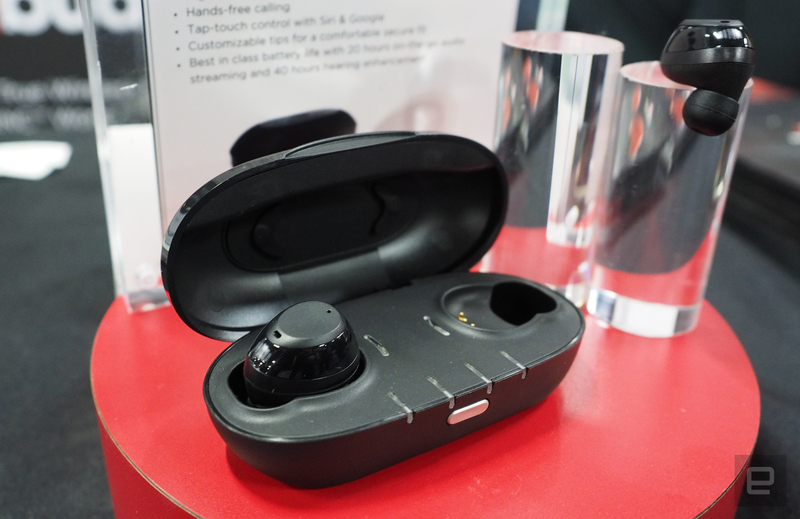 The company is also debuting a model with active noise cancellation for regular use. Now that the truly-wireless earbuds craze is here, companies are looking to find ways to stand out from the crowd. Thanks to the Over-the Counter Hearing Aid Act of 2017, the US government freed up access to certain assisted hearing devices in a move that should also make them more affordable. At CES 2018, a number of companies are showing the tiny audio devices that can help people hear better, announcing products or plans for gadgets that will offer assistive listening. One of those is Nuheara. The company is showing off its IQBuds Boost here in Las Vegas, a set of wireless earbuds that create a custom listening profile by evaluating the user's hearing. The device uses an app called Ear ID to do just that, calibrating the earbuds automatically to tailor them to each person. Nuheara says the app offers a hearing test you'd usually have to visit an audiologist to get. Of course, that personalization will also help users who can hear just fine but want a more custom sound from their earbuds. The customization extended to the touch controls on the outside of the earbuds as well. You can set specific controls (volume, play/pause) for a tap, double tap and long press. You can expect five hours of listening time or 20 hours of Bluetooth audio and 40 hours of sound amplification when you factor in the extra charges the case offers. There's no word on price just yet, but the IQBuds Boost are slated to arrive by April. If active noise cancellation is a deal-breaker when it comes to headphones, Nuheara's LiveIQ offers that feature in a set of wireless earbuds. The company says the model is "one of the first intelligent truly wireless earbuds" to pack in ANC, pairing it with "unique hearing intelligence software." What's more, they'll offer four hours of audio (up to 16 hours total with the charging case) and cost under $200 when they arrive this summer. Pre-orders will begin soon. Nuheara has also extended the battery life for its IQBuds that have been on sale since January 2017. With the updated model, you can expect up to 20 hours of Bluetooth streaming and up to 40 hours of speech amplification. Not too shabby.